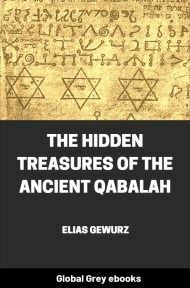 Written from a Theosophical viewpoint, this volume has a lot more Kabbalah content than Hidden Treasures of the Ancient Qabalah (Gewurz's other book). 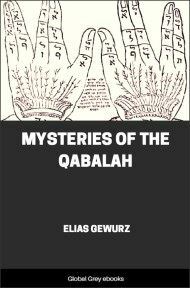 Gewurz explains the 'signatures' of each Hebrew letter, the use of techniques such as permutation and numerology to find deeper meaning in the sacred writings, and the history and bibliography of Jewish mysticism. Although, strictly speaking, this is uncredited, the title page mentions 'E.G.' and most library catalogs list this as attributed to Gewurz. —From the Writings of Moses Maimonides. 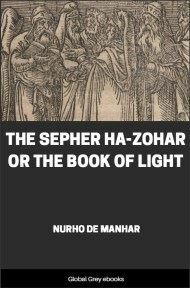 —Aleph.—Man himself as a collective unity, a principal, the lord and master of the earth. The universal man, and the human genre. Esoterically, unity, the central point, the abstract principle of a thing; as a sign it expresses power, stability, and continuity; the superlative, a kind of an article, as a prefix rendering the meaning more serious and enhancing its significance. —Beth.—The mouth as man's organ of speech, his interior, and his habitation; it denotes virility, paternal protection, and interior action, and movement. It is the integral and indicative article of the Hebrew language. This letter in conjunction with the one preceding it—Aleph—forms all ideas of progress, of graduated advance, the passage from one state into another = locomotion. —Gimel.—The throat, and everything that is hollow. It denotes every kind of opening, outlet, canal, and all manner of things concave, hollow, and profound, it expresses organic covering, and serves to produce all derived ideas of the bodily organism and its actions. —Daleth.—Signifies breast, bosom. 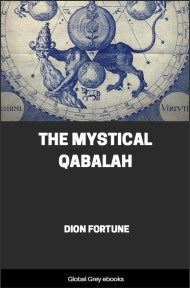 It is the emblem of the universal quaternary, that is the origin of all physical existence. Symbolically: every nourishing substance, and abundance of possessions. —Hai.—Everything that vitalizes, i.e., air, life, and being. It is the symbol of universal life, and represents the breath of man, the spirit, and the soul. Everything that vivifies. Life, and the abstract idea of being. It is an article, especially emphasizing and giving prominence to objects, and persons. —Waw.—Signifies the eye of man and becomes the symbol of light; it also represents the ear and becomes the symbol of the sound of the air, the wind. In its quality as a consonant it is the emblem of water, and represents the taste, and the appetite. As a grammatical sign it is considered to be the image of mystery most profound, and most incomprehensible, the symbol of the knot that unites, and of the point which separates Being and Non-being. —Zain.—Signifies whistling, and applies to all piercing noises which penetrate the air and reflect themselves in it. As a symbol it is represented by a stroke, a dash, and an arrow. Everything that tends to a given point. As a grammatical sign it is the abstract image of a tie which connects things with one another. —Cheth.—Signifies the principle of vital aspiration and is the symbol of elementary existence. It represents the field of man, his labour, and everything that requires an effort on his part; his care, his solicitude. As a grammatical sign it holds a middle place between the sign of life absolute and the sign of relative life. It also is the image of equilibrium, and of equality, and attaches itself to all ideas of effort and of normal action.